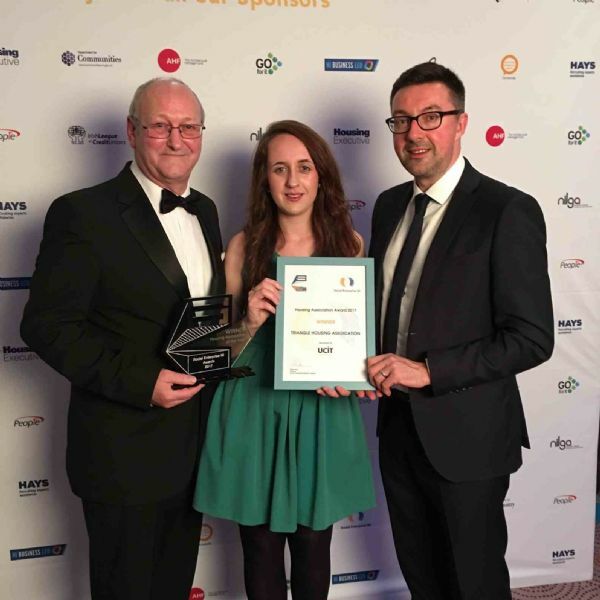 Social Enterprise NI, an organisation promoting and supporting social enterprises across Northern Ireland, hosted the Social Enterprise NI Awards on Friday 27 October at The Stormont Hotel, Belfast. The awards, presented by UTV’s Paul Clark, recognised and celebrated the excellence in social enterprise and the outstanding achievements of social entrepreneurs to deliver social impact. We were delighted to be announced as the winner of the Housing Association category, which recognises the contribution that Housing Associations make to their local community and social enterprise sector in general. Norman Sterritt, Progression to Employment Manager at Triangle Housing said “I am proud that the work of Triangle Housing Association was recognised at the 5th Social Enterprise NI Annual Awards ceremony on Friday evening at the Stormont Hotel, Belfast. I am delighted and honoured to collect the award of Winner of the Housing Association category along with my Alternative Angles colleagues Grace Uitterdijk and Brian Shaw”.